Spoiler...... Omg the episode tomorrow can't wait!!. Wallpaper and background images in the Justiça Jovem club tagged: young justice wally. Omg the episode tomorrow can't wait!! This Justiça Jovem photo contains anime, banda desenhada, manga, desenhos animados, mangá, and quadrinhos. Hes only 16 weeks old!!!!!!!!!!!! Not YJ but still cute! STOP TREATING ME LIKE A BABY! Do I have to wear this disguise? How could you think I wouldn't recognize your touch inside my mind? I have no image name. WALLY!!!!!!!!!! YES!!!!!!! BIRDFLASH IS BACK!!!! He doesn't look like he aged much just got taller please let Artemis be alive she can't be dead she just can't. But yay Wally is alive. Am I the only one who squealed 'Wally!' when they saw this picture? I cried when I saw this on Tumblr!!! @YJgirlforever He dose look the same and taller it happen 2 me to every summer when I get bac from school everyone goes you haven't changed u just got taller!!! 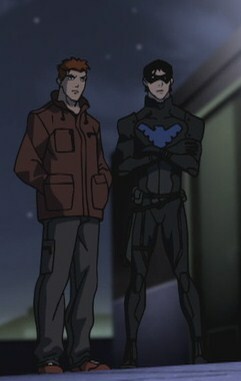 One will rise-Robin be came NightWing. One will fall- Aqualad becomes evil. One will die- I would say Artimis because she's the last one. But I'm just saying ther are many theorys to this. There are a lot of theorys sge's alive. This is hand-drawn. Sorry to put everyone in a bad mood, but facts are facts. saw this episode and jumped up and down squealing and crying. It may be handrawn but we actually see them in the 4th ep. Robin has no choice. Wally finds out his secret identity.